Grand Junction Railroad tracks across Massachusetts Avenue in Cambridge, in the center of the MIT campus. Note railroad crossing signal. Passing through Cambridge, particularly nearby MIT, you may have noticed a seemingly abandoned railroad making its way between buildings and across roads. The ties are overgrown with weeds, and months pass without a single train passing along the tracks. Grand Junction Railroad at its intersection with Cambridge Street in East Cambridge, looking towards McGrath Highway in Somerville and the train tracks leading to North Station. As you can see, the right-of-way is quite overgrown, though not so much that a train could not pass. Route of the Grand Junction Railroad through Cambridge, Somerville, Charlestown, Chelsea and East Boston. As you can see in the map above, the Grand Junction Railroad begins as an offshoot track off of the railroad right-of-way along the Mass Pike highway (once a dedicated railroad right-of-way for the Boston and Albany Railroad—more on that in "Copley Square"). 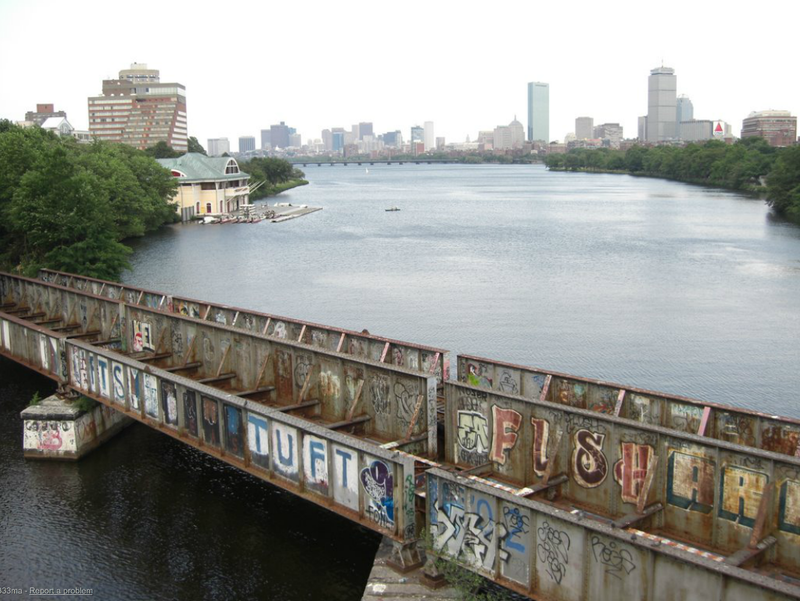 The railroad crosses over the Charles River and then snakes through the MIT campus and East Cambridge to reach the tracks leading from west and north of Boston into North Station. 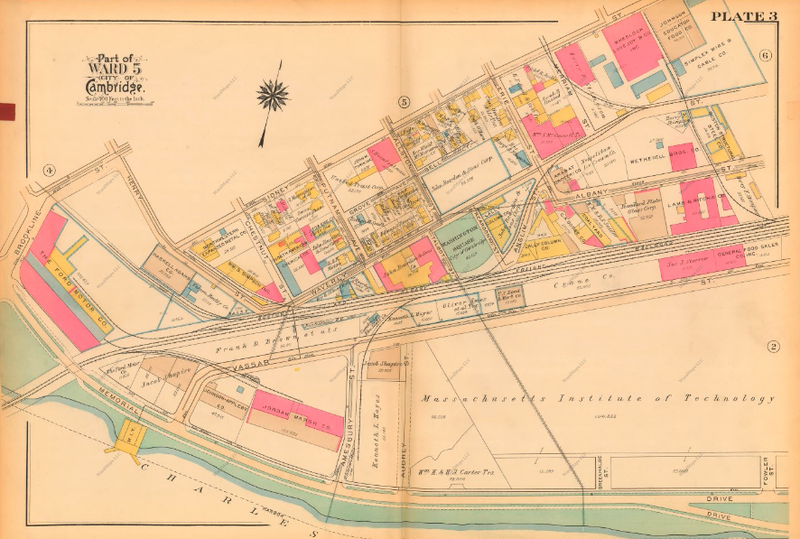 The railroad then continues through Charlestown and Sullivan Square to reach the industries in Chelsea and East Boston, ending in the Maverick Square/Jefferies Point area of East Boston. The Grand Junction Railroad's bridge today, rusty and in dilapidated condition, under the Boston University Bridge and over the Charles River. Image copyright Google Street View. The areas the Grand Junction Railroad passes through were once centers of industry in Boston. The area around the MIT campus and East Cambridge was once most notable for its manufacturing and storage factories. 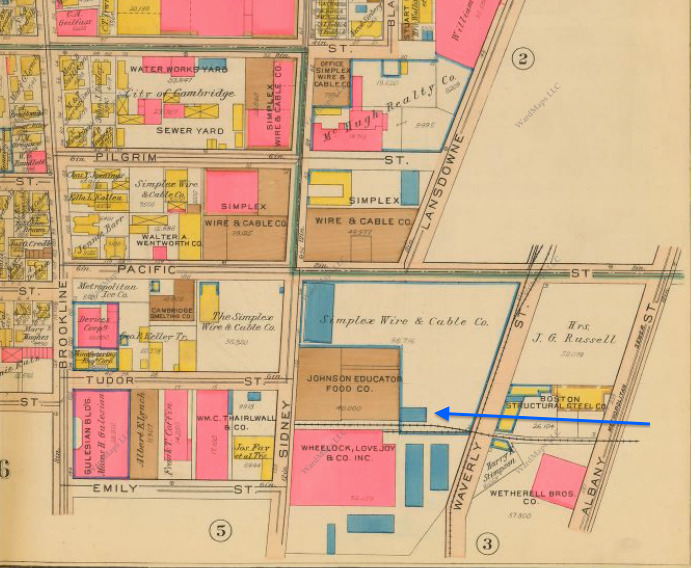 Such businesses evidently developed around the Grand Junction Railroad: If you look at a 1903 Bromley map of the area around MIT, the university has not yet arrived on the premises and barely any development has taken place; the development that has taken place is all industrial. 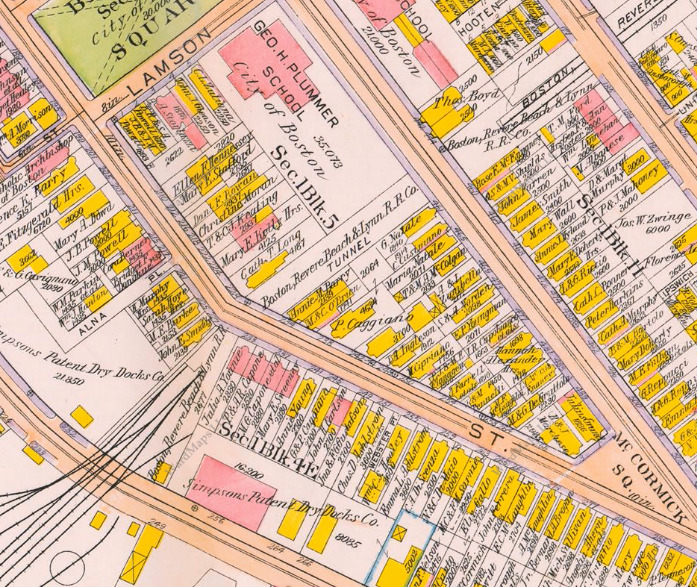 Bromley map of the area around the Massachusetts Avenue—Vassar Street intersection as it stood in 1903. As you can see, barely any development has taken place—MIT is still based in Copley Square, and very few factories have been built. The former armory as viewed from Vassar Street today; the building is now owned by MIT. The massive Metropolitan Storage Warehouse along Vassar Street by MIT, with the Grand Junction Railroad located directly behind the building. The Warehouse still functions as a storage warehouse today, Metropolitan Moving and Storage. A 1903 Cambridge factory listed as owned by "Aug. G. Bullock Tr." with railroad spurs connecting it to the main Grand Junction Railroad. The area around the Vassar Street—Massachusetts Avenue intersection in 1930. 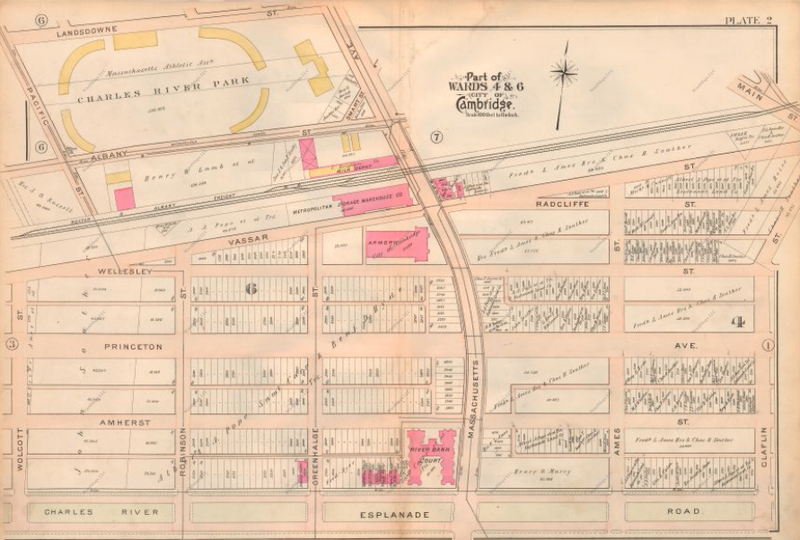 In 1903, two factories were located between Pacific Avenue, Lansdowne Street and Massachusetts Avenue—now there are over ten! 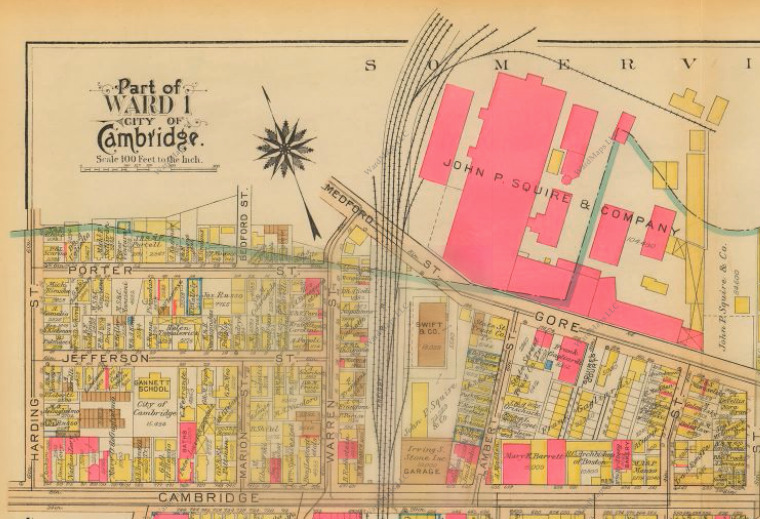 In 1903, as shown earlier, there were only two factories in the area of Cambridge along Vassar Street shown above. Now, in 1930, there are many more factories, almost all with private railroad spurs leading to them! 1930 Bromley map showing factories directly behind houses in Cambridgeport! Second 1930 Bromley map showing factories reaching up to Brookline Street, residential Cambridgeport's main thoroughfare, some of them with private spurs extending three blocks away from the main Grand Junction Railroad! Above are two views of factories further away from the Grand Junction Railroad in residential Cambridgeport. Some factories are across the street from, or even adjacent to, residential lots! Railroad spurs link these factories to the main railroad; even some factories further from the main Railroad have their own private spurs! Shown earlier were Metropolitan Storage Warehouse and a former US Army-affiliated Armory, both of which remain today just by the Vassar Street-Massachusetts Avenue intersection. 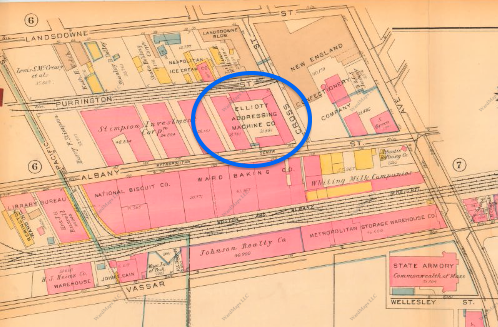 Edgerton House, then the Elliott Addressing Machine Company, is circled in blue. The building is on Albany Street, a block north of the Grand Junction Railroad. Storage centers along the Grand Junction Railroad and Medford Street in Somerville, between Cambridge Street and McGrath Highway. 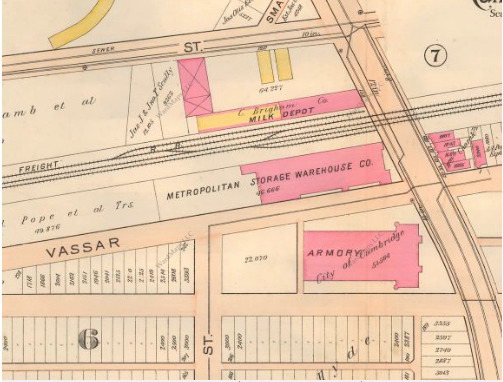 Industrial buildings by Medford Street and the Grand Junction Railroad in 1930 as shown on a Bromley map of the area. Note that the number of tracks running through the area has since been reduced from over five in 1930 to just one today as shown above in Street View. From here the railroad continues into the rail yard formerly owned by the Boston and Maine Railroad and today used by the MBTA to store and service MBTA commuter rail trains. From East Cambridge, the Grand Junction Railroad continues through the Cambridge rail yard formerly owned by the Boston and Maine Railroad and today used to store and service MBTA commuter rail trains. A significant chunk of the rail yard is now being redeveloped as part of the NorthPoint commercial and residential development on the premises, yet it remains a major utility hub for the MBTA. The Grand Junction Railroad exits the yard via a shared track owned by the MBTA today and used by many other heavy rail lines that run to municipalities north of Boston. The track out of the yard was formerly used by both the Boston and Albany Railroad, the former owner of the Grand Junction Railroad, and the Boston and Maine Railroad, another railroad company that served areas north and west of Boston. Path of the Grand Junction Railroad, shown with dark blue arrows, through the rail yard at NorthPoint, circled in orange, shown on a Google Map. 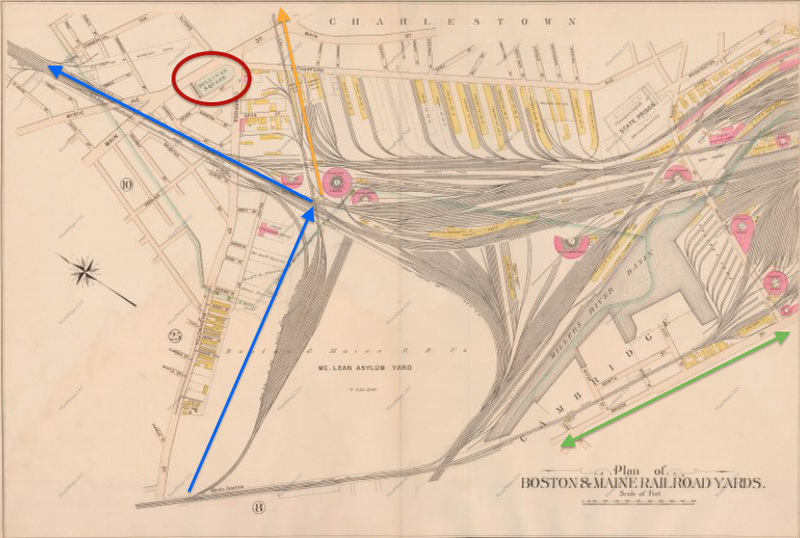 The light blue arrows show an alternate spur of the Boston and Maine Railroad that runs to Boston Autoport. The green arrow points to North Station for orientation purposes—the rail yard primarily serves MBTA commuter rail coaches that serve lines that serve North Station—or in other words, northern commuter rail lines. The exception is the Grand Junction Railroad, the only railroad that connects the yard with Boston's southern rail infrastructure. Leaving the rail yard, the Grand Junction Railroad passes along a shared track until slightly after Sullivan Square, circled in red, where it splits east along with the Newburyport and Rockport branches of the MBTA Commuter Rail. 1895 Bromley map showing the Grand Junction Railroad's path out of the NorthPoint rail yard in greater detail. The blue arrow shows the route the Grand Junction Railroad takes to exit the yard; the arrow that passes Sullivan Square shows the shared track mentioned previously. 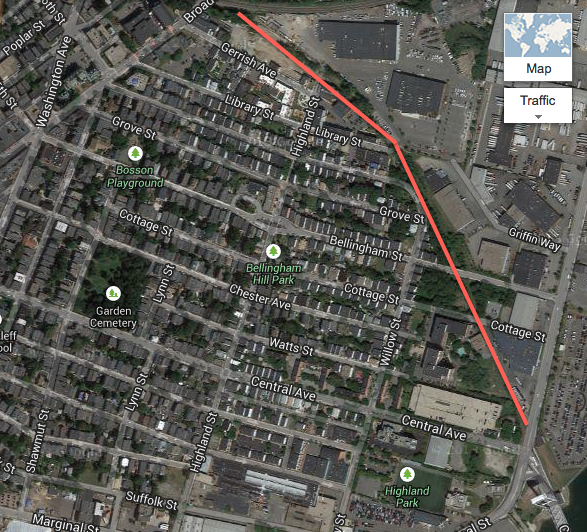 The orange arrow shows a spur of the Boston and Maine Railroad that leads to the Sullivan Square area and ultimately to nearby Boston Autoport. 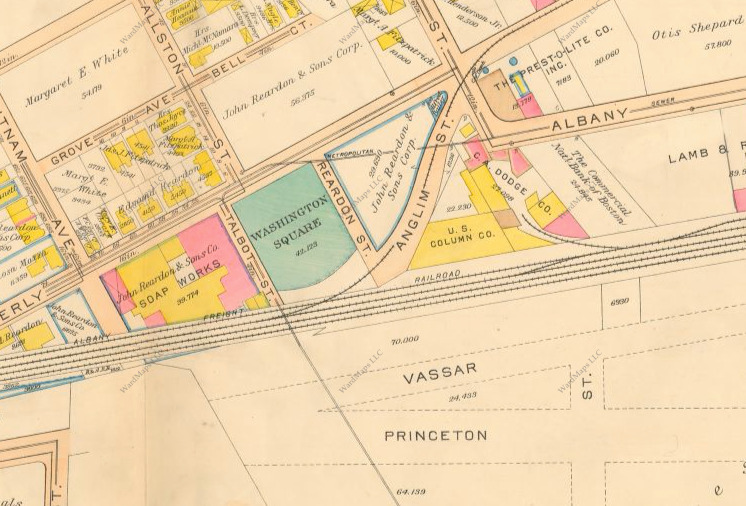 Closer view of the 1895 Bromley map shown above and the NorthPoint rail yard, then owned by the Boston and Maine Railroad. 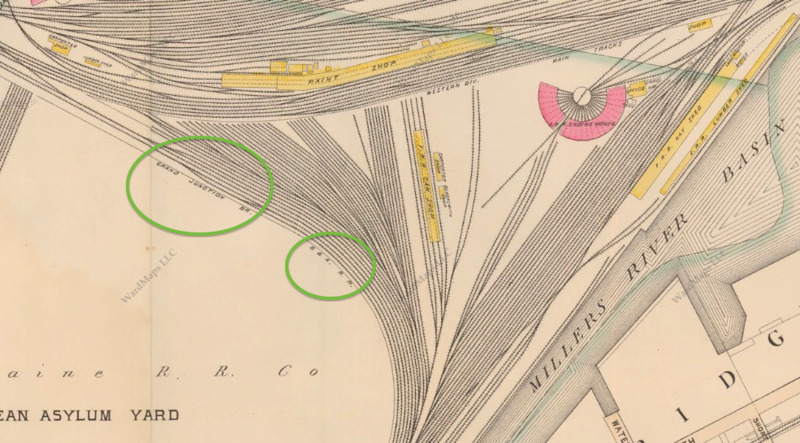 As you can see circled in green, the Grand Junction Railroad, owned and operated by the Boston and Albany Railroad, ran through the Boston and Maine Railroad's rail yard. The Railroad ran parallel with Boston and Maine Railroad lines north of Boston along the shared track out of the yard discussed previously. 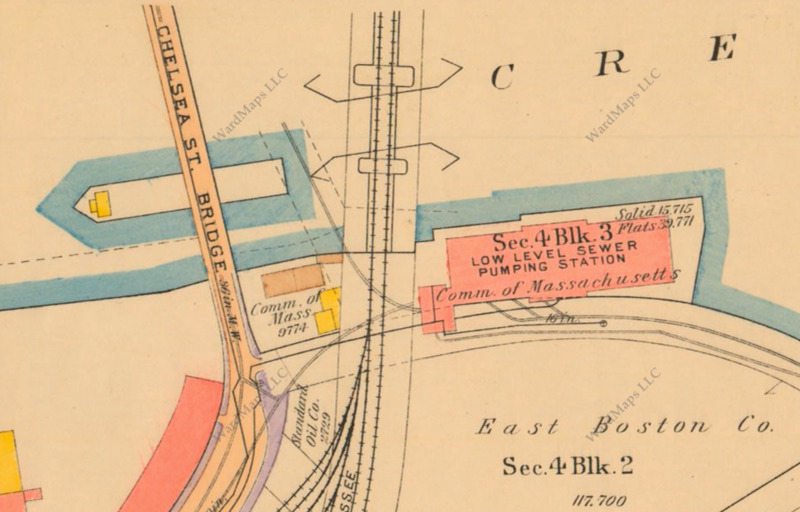 An alternate nearby freight railroad route just mentioned and worth elaborating upon is a spur owned and operated by the Boston and Maine Railroad that leads to Charlestown's industrial district—Sullivan Square and Boston Autoport/Mystic Pier. The spur exits the NorthPoint rail yard using the same main track as the Grand Junction Railroad and then splits east just before the main track passes Sullivan Square, as shown on the Google Map just posted. The alternate spur of the Boston and Maine Railroad remains active nowadays yet sees little to no use due to inactivity in the area. While Mystic Pier was once a major freight delivery terminal in Boston home to many industrial businesses, nowadays South Boston's Seaport District sees greater activity due to its location nearer to I-93, which opened in the 1960s (to learn more about Boston's highway projects, see "Boston's Cancelled Highways" and "Copley Square"). Mystic Pier is now used to deliver new cars to Boston (hence the name "Boston Autoport"), and the cars are trucked from the Pier to dealerships due to railroad height restrictions in Boston. 1912 Bromley map index plate showing the path of the Boston and Maine Railroad's "Terminal Branch" freight spur out the nearby rail yard to Mystic Pier. Boston and Maine Railroad freight spur crossing over Rutherford Avenue in Charlestown, just by Sullivan Square with the Schrafft's Candy and Chocolate Company building in the distance. 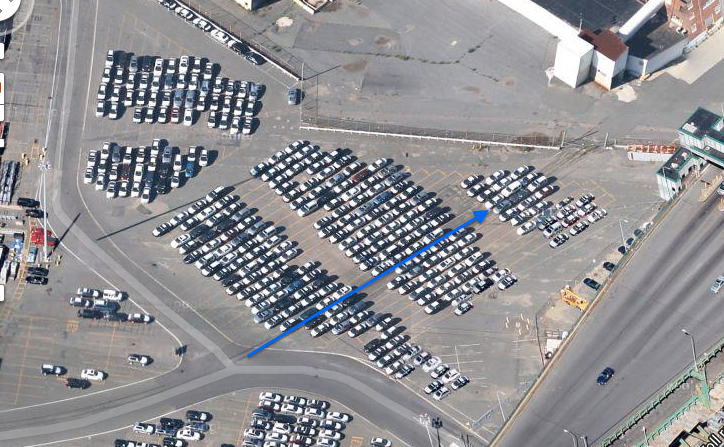 Note: To learn more about Sullivan Square, see "Sullivan Square"
Boston and Maine Railroad spur tracks running through Boston Autoport; the new cars parked on the tracks are a testament to the spur's rare usage. After passing Sullivan Square, the Grand Junction Railroad splits along with the Newburyport and Rockport Lines of the Boston and Maine Railroad and passes through Chelsea. Just after passing Broadway in Chelsea, right after passing the present location of the Chelsea MBTA Commuter Rail station, the Grand Junction Railroad splits off from the Boston and Maine Railroad. When it was active, the railroad would cross Chelsea Creek on a dedicated drawbridge to reach East Boston, where there were multiple industries in need of freight rail service. The Grand Junction Railroad would then continue along a dedicated right-of-way to reach Jeffries Point in East Boston, its final destination. 1891 Walker map showing the path of the Grand Junction Railroad through Charlestown, Chelsea and East Boston. Note the absence of Logan Airport—the airport will be built on landfill around Wood Island Park, shown in the map below, in the early 1920s. Map courtesy Ward Maps. 1892 Bromley map of East Boston. 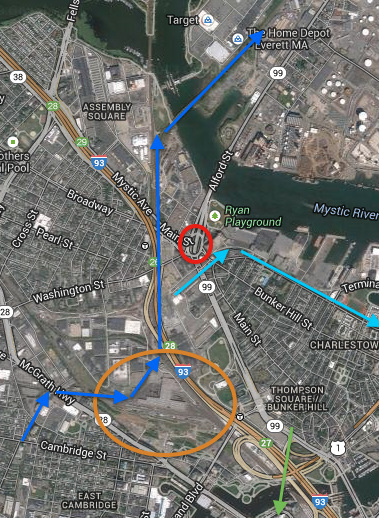 The red arrow shows the path of the Grand Junction Railroad through East Boston to Jeffries Point, passing just by Maverick Square (circled in orange). 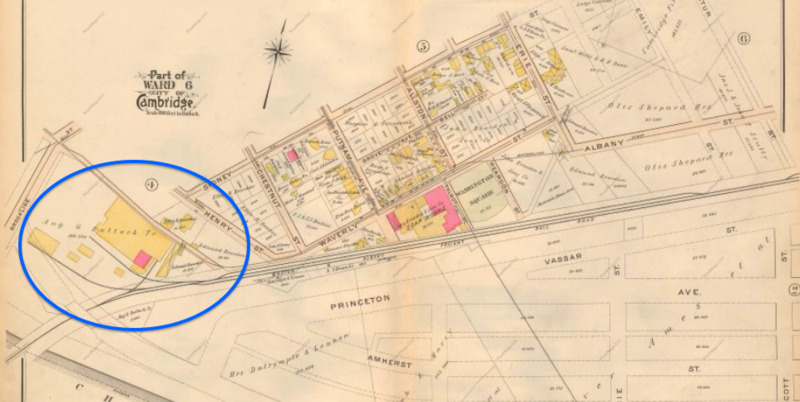 Note the blue arrow, which shows the path of the Boston, Revere Beach and Lynn Railroad, a commuter railroad coming from the North Shore that also terminated in Jeffries Point. Commuters arriving via the B RB & L RR would then take a ferry to Rowes Wharf in Downtown Boston. 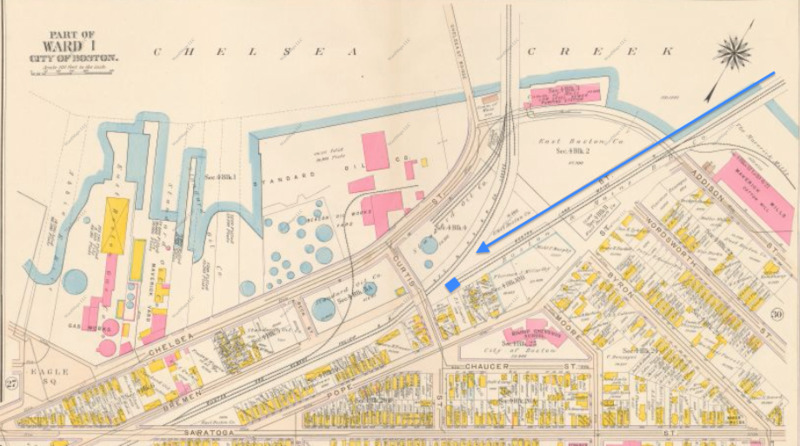 1912 Bromley map showing the area of the Grand Junction Railroad's coverage in East Boston closest to Chelsea Creek. As you can see, many industrial businesses lined the railroad here, particularly Standard Oil, which had a dedicated railroad spur. 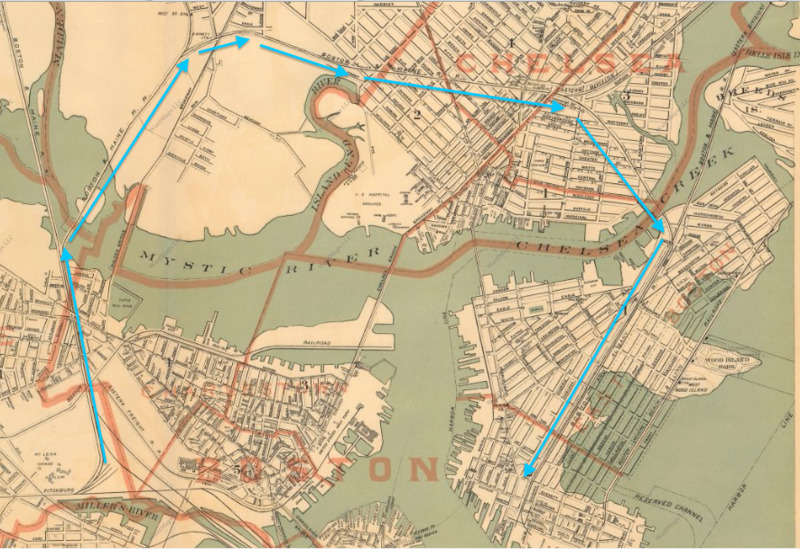 Note that the Boston and Maine Railroad extended into East Boston, as shown by the blue arrow, but terminated by Chelsea Creek, as shown by the blue square, leaving the Grand Junction Railroad as the only freight railroad to serve East Boston. 1922 Bromley map showing the layout of the Grand Junction Railroad's bridge over Chelsea Creek in greater detail—cars would cross over the Chelsea Street Bridge, and Grand Junction Railroad trains would cross over the train bridge at the car bridge's side. 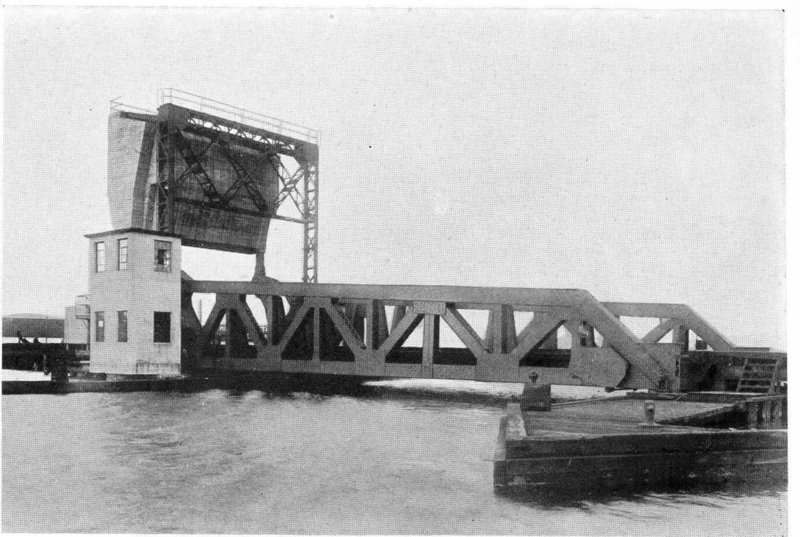 Photo of the Grand Junction Railroad's dedicated drawbridge over Chelsea Creek. Image courtesy bridgehunter.com. 1922 Bromley map of the Jeffries Point area. Blue arrow shows the path of the Grand Junction Railroad along the piers of Jeffries Point, which served businesses such as Leyland Steamship Company, shown here. 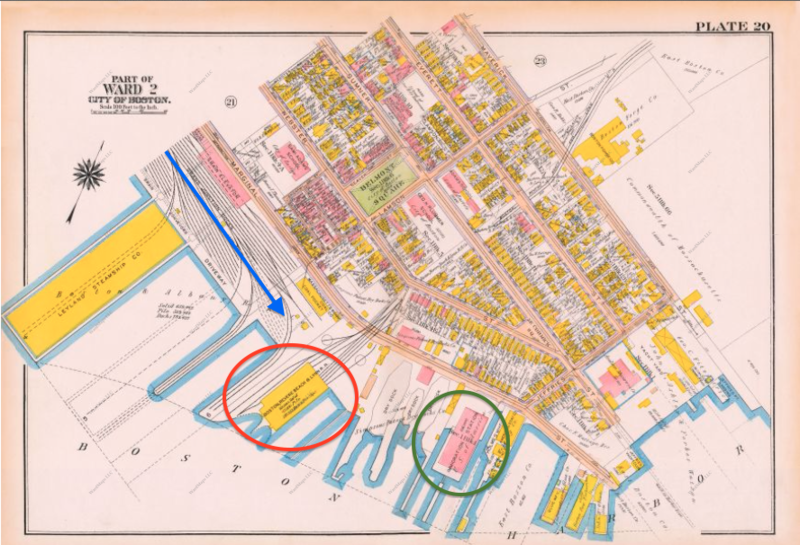 Circled in red is the Boston Revere Beach and Lynn Railroad's track terminus and ferry terminal, where riders would board a ferry to continue onward to downtown Boston. 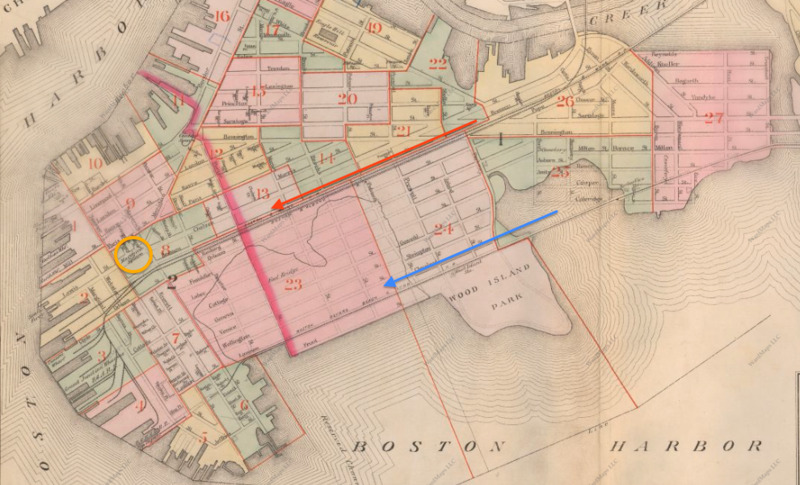 Circled in green is the East Boston Immigration Station, where immigrants would have arrived via boat from 1920 to 1954. The Station stood vacant for almost sixty years before being demolished in 2012. View of the Jeffries Point end of the East Boston Greenway, an urban recreational path which runs along the southern section of the former Grand Junction Railroad right-of-way. The Greenway opened in 2007 and consists of landscaping and walking/running/biking trails. Note the decommissioned caboose in the view above, most likely once used on the Grand Junction Railroad. 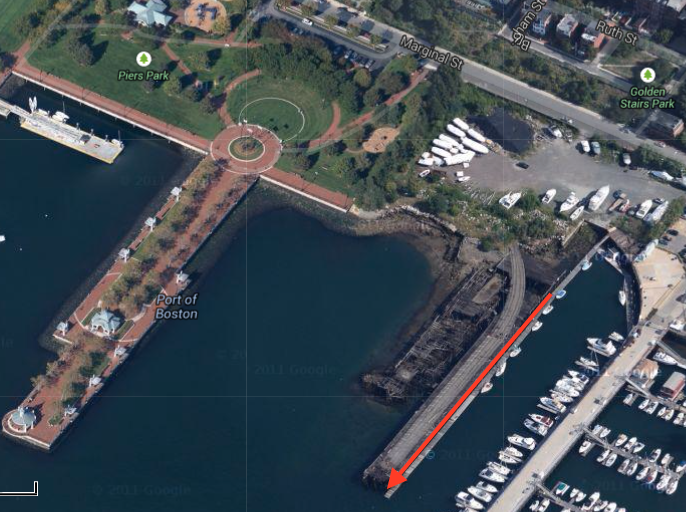 Google Maps aerial view of Piers Park, an extension of the East Boston Greenway's landscaping along Jeffries Point. Note that Grand Junction Railroad tracks still remain along some of the piers of Jeffries Point, such as the one along the red arrow in the view above. There are many more remnants of Jeffries Point's past as a substantial Boston port. The ferry terminal once used to carry passengers arriving on the Boston, Revere Beach and Lynn Railroad, another railroad that ran to Jeffries Point, to downtown Boston still stands on Jeffries Point today. Until its demolition in 2011, an immigration station originally constructed in the early 1920s and active until the mid-1950s (coincidentally also the date of the end of service on the East Boston branch of the Grand Junction Railroad) stood on Jeffries Point. Up ahead on the right is the former B RB & L RR ferry terminal on Jeffries Point. Below is the old immigration station, which has since been demolished. Another most interesting remnant of the Boston, Revere Beach and Lynn Railroad that can be found around Jeffries Point is the railroad's abandoned tunnel running from Everett Street to Jeffries Point. The tunnel was built to ease the railroad's passage down the steep incline between Everett Street and Jeffries Point and remains today in its original form, though all tracks have since been removed for scrap metal. The tunnel has been mostly filled in so as to prevent it from caving in, and it is thought to be too hazardous for anyone to explore. The tunnel is completely abandoned and has not been maintained for almost seventy years; accordingly, no homes have been built above the tunnel's path as it is thought that the tunnel would not be able to support the weight of a building. 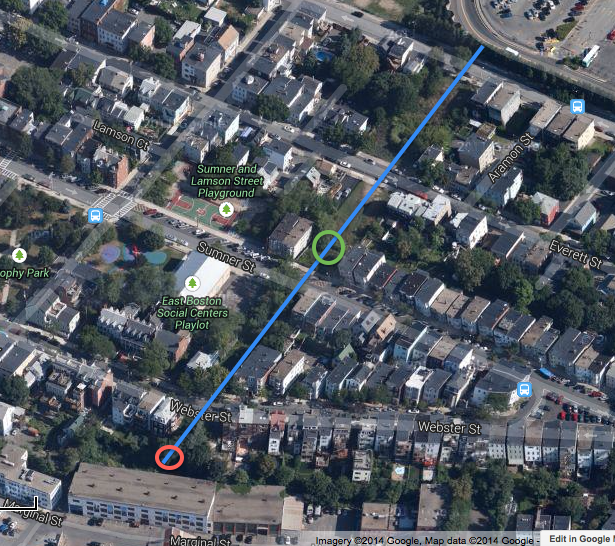 Google map of the tunnel's path between Everett Street and Jeffries Point. The tunnel's path is outlined in blue; note that there are no buildings built on top of the tunnel. The northern portal of the tunnel is circled in green, and the southern one in red; both portals remain today in their original form, albeit covered in overgrowth. Beautiful view of the Boston skyline from the Jeffries Point hill. As you can see, there is a steep drop down to the piers of Jeffries Point; swivel around 180 degrees on the street view, and you will see that there is a steep climb upward as well. Thus, in order to ease B RB & L trains' path up and down, the B RB & L RR built a tunnel down the hill. 1922 Bromley map showing the path of the tunnel down the hill. As you can see, there were no buildings built on top of the tunnel even back when it was regularly maintained. View of the northern tunnel portal just off of Everett Street; the half-circle portal entrance is visible just behind the thick overgrowth. The southern portal is not visible from the street as a building blocks access to it from Jeffries Point. 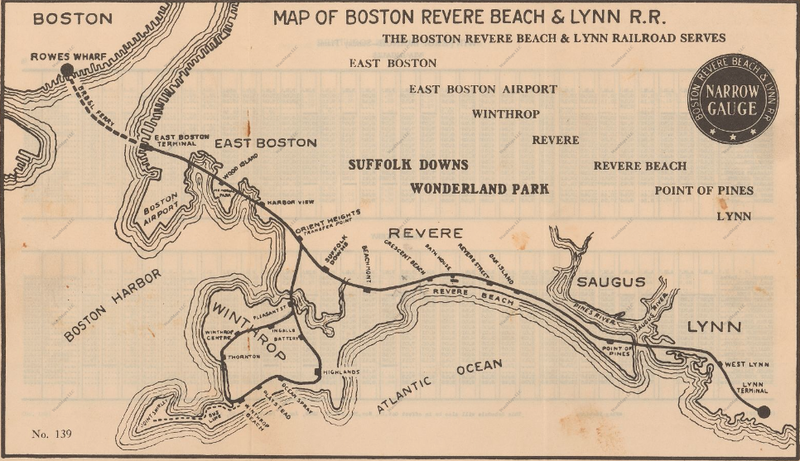 Boston, Revere Beach and Lynn Railroad map showing the former route of the railroad between Lynn and Jeffries Point, where riders would board a ferry to Rowes Wharf in downtown Boston. The northern section of the East Boston Grand Junction Railroad remains as well; the right-of-way has been repurposed into the Martin A. Coughlin Bypass Road, a special access road for MassDOT, emergency and other commercial vehicles to reach Logan Airport without mixing in with regular traffic. View of the southern end of the Martin A. Coughlin Bypass Road, still under construction at the time this photograph was taken. Google map of the path of the Martin A. Coughlin Bypass Road, outlined with red arrows. The road begins as an offshoot from Chelsea Street along a former Grand Junction Railroad industrial spur and continues south along the main railroad until Logan Airport, where the East Boston Greenway begins. The entrance to the bypass road off of Chelsea Street, shown back when it was still an abandoned Grand Junction Railroad spur. Continuation of the abandoned spur across Chelsea Street. These tracks still remain in the street in their original form, as they were not paved over to make the bypass road. Tracks remaining in the pavement crossing Eastern Avenue in Chelsea, just by Chelsea Creek and the old railroad drawbridge that carried the Grand Junction Railroad to and from East Boston. The bridge was demolished in the 1950s following the end of service on the East Boston Grand Junction Railroad. The Grand Junction Railroad right-of-way in Chelsea, as well as what is now the Martin A. Coughlin Bypass Road, will be used in the near future for an extension of the MBTA's Silver Line bus rapid transit line. 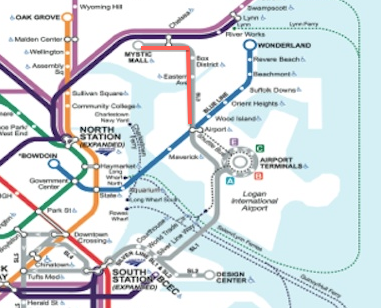 The Silver Line, which currently terminates at Logan Airport, will be extended further into East Boston and into Chelsea, where it will join the commuter rail (and former Grand Junction Railroad) right-of-way and run along it to Mystic Mall in Chelsea. Silver Line Extension, outlined in red, shown on a projected 2024 MBTA map officially released by the MBTA in its Transportation Capital Investment Plan published in late 2013. 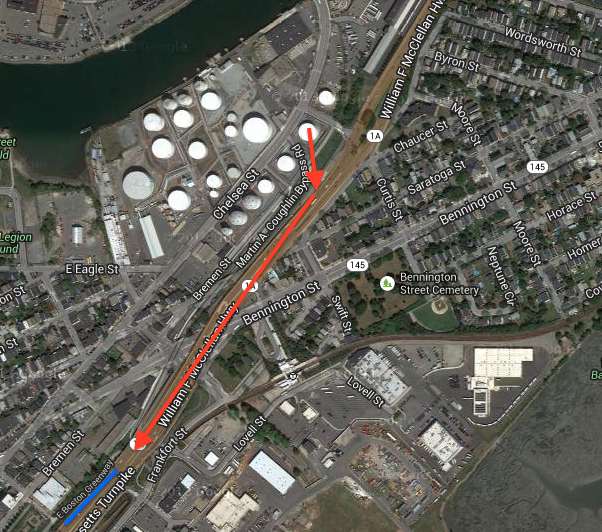 Route of the abandoned Grand Junction Railroad right-of-way through Chelsea, passing between Chelsea Creek and the Newburyport/Rockport commuter rail line, outlined in red. Remnants of the Cambridge section of the Grand Junction Railroad are even more prevalent, given that the main railroad there remains intact and active to this day, albeit with much less traffic. Since MIT began buying and redeveloping industrial properties around it and freight transport via rail began to be phased out in favor of air travel and trucking, the Grand Junction Railroad has seen dramatically less usage—nowadays, about the only traffic the Cambridge Railroad sees is non-revenue transfers of MBTA commuter rail and Amtrak equipment from Boston's northern rail lines to the city's southern lines and the occasional freight train. Such transfers are very infrequent yet cannot be done without the Grand Junction Railroad, which serves as the only North-South connecting rail in Boston as plans for a North-South Rail Connector in Boston remain in limbo. Accordingly, the Cambridge Railroad has fallen into disuse and disrepair. In spots where the railroad once numbered five tracks across, the railroad has been cut down to a single track. 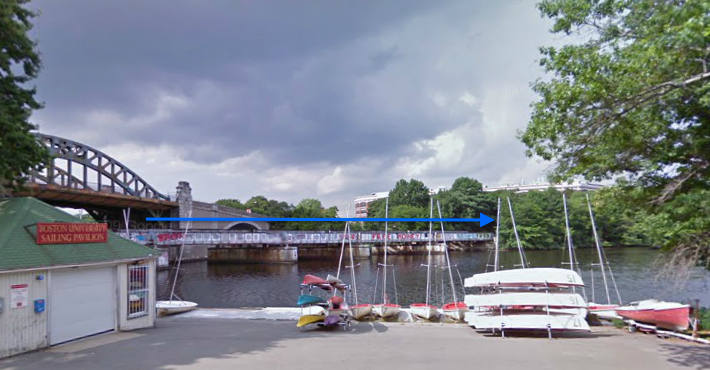 The part of the railroad that remains, particularly the bridge over the Charles River by BU, is very unreliable. From November 2012 to January 2013, the railroad was closed to all traffic due to the bridge's deteriorating condition. This closure was following a decree issued less than a week earlier that trains would be restricted to travel at no more than 5 MPH on the entire railroad. The railroad reopened again in January but was then closed from March until June for major repairs on the Charles River bridge. The bridge is now traversable but remains in very poor condition. Likewise, further along the railroad, many industrial spurs once used to deliver freight directly to factories have been abandoned and remain today covered in dirt and overgrowth and, in many cases, almost completely paved over such that the spur's remaining trackage is disconnected from the main railroad. The rusty, heavily vandalized and overall decrepit Grand Junction Bridge over the Charles River. Image copyright Panoramio User @ma333ma. Abandoned, disused Grand Junction Railroad spur off of Waverly Street by MIT. Swivel the Street View around, and you will see that the spur is just about completely covered by sand, making it impossible for trains to use the tracks. Just as the abandoned Grand Junction Railroad right-of-way in Chelsea will soon be rehabilitated and repurposed as the Chelsea extension of the Silver Line, the Cambridge branch of the Grand Junction Railroad will soon see new usage as a branch of the upcoming Indigo Line. The Indigo Line is a new initiative of the MBTA to bring more frequent service with more frequent stops among existing commuter rail lines as well as to bring back service to two disused railroads along which demand for service has resurfaced. 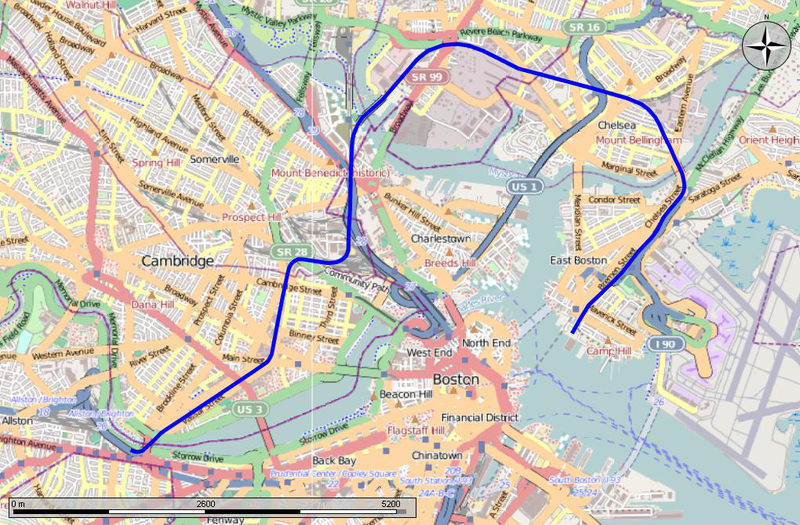 One of those disused railroads is Track 61 in South Boston, where the MBTA will be building an Indigo Line branch that will connect Back Bay Station by Copley Square with the Boston Convention and Exhibition Center in the trendy Seaport (since rebranded as the "Innovation") District. The other railroad that will see new service is the Cambridge branch of the Grand Junction Railroad. The new line will begin at a new station, "West Station," to be built in Allston and will continue along the Grand Junction Railroad, making a stop in Cambridge by MIT before continuing onwards to North Station. The new line will fill a special niche, linking jobs and education at MIT with housing in Allston and more housing and businesses in downtown Boston. 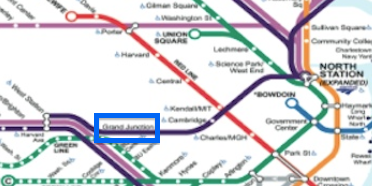 Grand Junction Indigo Line branch shown on the MBTA's projected 2024 map. After lying dormant in the case of the Chelsea/East Boston section, or virtually dormant in the case of the Cambridge section, the Grand Junction Railroad is set to become a prime example of how disused urban space built for a function that is no longer relevant can be repurposed to address new needs and serve a new, relevant purpose in a modern city. Just as the Southwest Corridor, cleared to become a planned highway that was later cancelled (more on that in "Boston's Cancelled Highways"), became the Southwest Corridor Bike Path, community gardens and the new right-of-way for the Orange Line, so too the Grand Junction Railroad right-of-way has already been repurposed into the East Boston Greenway and Martin A. Coughlin Bypass Road and will soon come to host the Silver Line Extension into Chelsea and the Cambridge Indigo Line. As Boston continues to grow, it will become increasingly important for disused space to be redeveloped and used to fill gaps in commercial, residential and transit development. The Grand Junction Railroad is an encouraging sign and a significant step in the right direction.